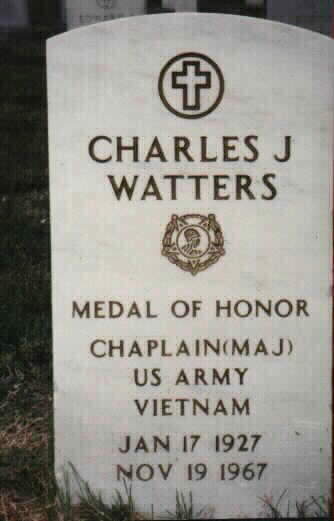 Charles Joseph Watters was born on January 17, 1927 in Jersey City, New Jersey. Watters attended Seton Hall Preparatory School and went on to graduate from Seton Hall University. He was ordained as a Catholic priest in 1953 and served in parishes in Jersey City, Rutherford, Paramus, and Cranford, New Jersey. Watters was an active private pilot, flying small single-engine planes as far as Argentina. 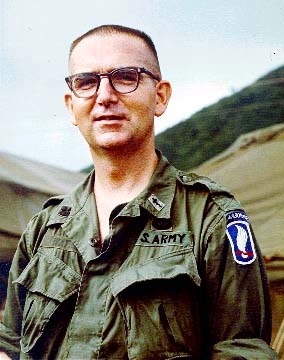 In 1962, Watters became a chaplain with the New Jersey Air National Guard. 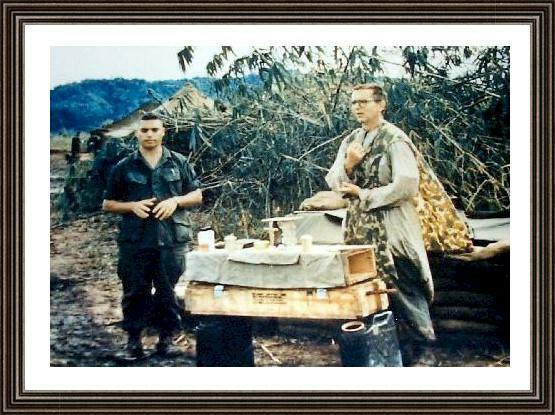 In 1964, he entered active duty as a chaplain with the U.S. Army. He began his first 12-month tour of duty in Vietnam on July 5, 1966. During his first tour, he was awarded the Air Medal and a Bronze Star for Valor. At the end of his first twelve months, in July 1967, he voluntarily extended his tour for an additional six months. before his death (November 19, 1967). The U. S. Army Chaplain Center & School is named in his honor – Watters Hall. 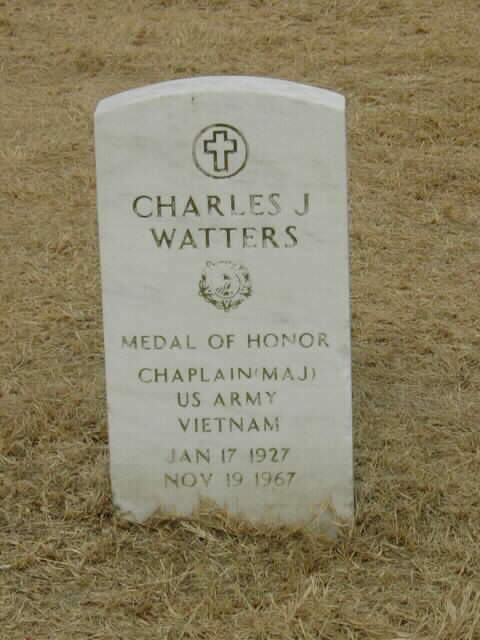 Born at Jersey City, New Jersey, January 17, 1927, Charles Joseph Watters earned the Medal of Honor while serving in Vietnam as Chaplain, Company A, 173rd Support Battalion, 173rd Airborne Brigade near Dak-To Province, Republic of Vietnam, November 19, 1967. For conspicuous gallantry and intrepidity in action at the risk of his own life above and beyond the call of duty. He distinguished himself during an assault in the vicinity of Dak-To. He was moving with one of the companies when it engaged a heavily armed enemy battalion. As the battle raged and casualties mounted, with complete disregard for his own safety, he rushed forward to the line of contact. Unarmed and completely exposed, he moved among as well as in front of the advancing troops, giving aid to the wounded, assisting in their evacuation, giving words of encouragement and administering last rites to the dying. When a wounded paratrooper was standing in shock in front of the assaulting forces, he ran forward, picked up the man on his shoulders and carried him to safety. As the troopers battled to the first enemy entrenchment, he ran through intense enemy fire to the front of the position to aid a fallen comrade. A short time later, the paratroopers had pulled back in preparation for a second assault. He exposed himself to both friendly and enemy fire between the two forces in order to recover two wounded soldiers. Later, when the battalion was forced to pull back into a perimeter, he noticed that several wounded soldiers were lying outside the newly formed perimeter. Without hesitation, and ignoring attempts to restrain him, he left the perimeter three times in the face of small arms, automatic weapons and mortar fire to carry and to assist the injured troopers to safety. Satisfied that all of the wounded were inside the perimeter, he began aiding the medics - applying field bandages to open wounds, obtaining and serving food and water, giving spiritual and mental strength and comfort. During this ministering, he moved out to the perimeter from position to position, redistributing food and water, and tending to the needs of his men. He was giving aid to the wounded when he was himself mortally wounded. His unyielding perseverance and selfless devotion to his comrades was in keeping with the highest traditions of the United States Army. 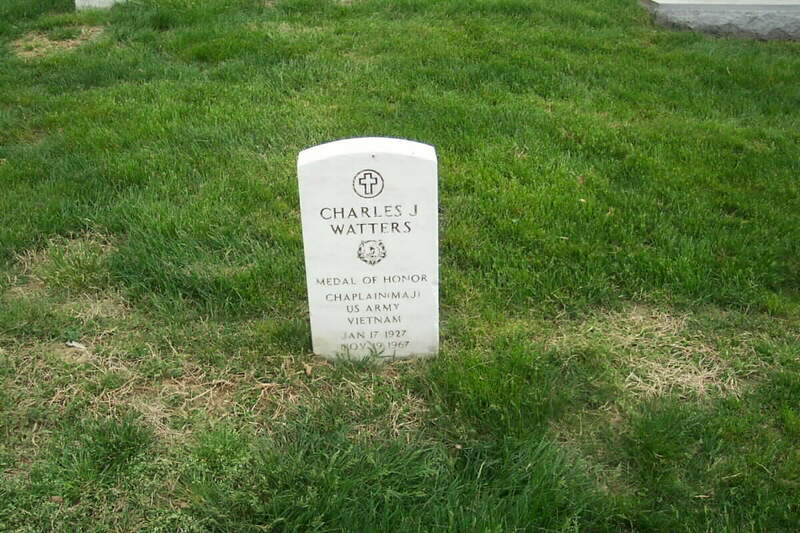 His two brothers accepted his posthumous Medal of Honor on November 4, 1969. He is buried in Section 2-E of Arlington National Cemetery.